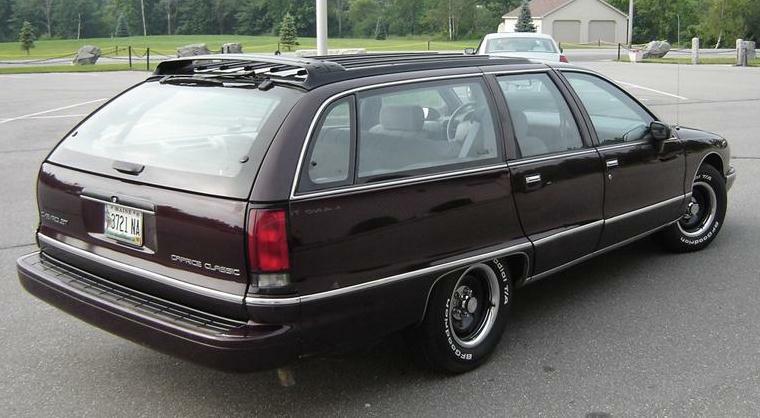 Ben Ayotte's 1994 Chevy Caprice Wagon! Ready for winter 2006!!! My snow tires on my Caprice Aluminum rims and ARTIC CLAW studded snowtires out back! Note the Chrome strip has been blacked out with electrical tape until I figure out if I like it. The above shots taken at the Cole Land Transportation Museum and my yard. After having spoken to many people about my new car, I can instantly tell you your first response. "Ha Ha!! !....Grandma's Wagon! "...well, they laugh until they sit in it and realize this is Chevy's best...the last American Cruiser. Stuffed with a Corvette derived LT1 5.7L V8, (260 HP, 330 lb-ft) this Shaggin' Wagon can really haul the mail. Throw in a nice ride and decent fuel economy (17 actual city, 23 actual highway), it's actually quite package. It also sleeps two, curtains optional. I purchased this Caprice Wagon on November 21, 2005 to use as a winter car. It had 32,850 miles It currently has 39,318 miles. I got it after I finely wore out my 1993 Pontiac Grand Prix SE 3.4L DOHC. After putting up with enough break downs and loss of accessories, it was time to replace her. Now, while I love the lines of the car, that isn't to say that a few things can't be improved. With the exception of snow tires and a few maintenance items, things are going to remain the same this winter, but come spring time, I'll be doing what every other Wagon owner has done and make this into an Impala SS wagon, wheels, dark trim, and some performance mods in the engine...lets say...to help up hills. Newspaper Ad for this Car! What car wouldn't be complete without upgrades...I have a few listed below. Ones you can click on are complete, or in progress, otherwise they are still in the planning stages. Motor Intake Paint (Now Gone) Hockey Puck/Sewer Pipe Intake Make your non-9C1 wheels look like it!